Funerals, travel, and holidays: how to make your business more sustainable, from the hard times out. As some of you know, I was out of town last week for a funeral. My husband's grandpa died. And it was hard, beautiful, and…exhausting. When we got back into town, I couldn't think clearly enough to work. Funerals, deaths, and heck, even the holiday season is stressful enough without also having to think about your business, and your bills. I'm blessed that I was prepared: the Holiday Sanity Kits continued to sell, the payment plans on the Starship came in on time, new people found my site and signed up for emails and got their How to Explore lessons, my bills got paid – because it's all automated and mobile-ready. The Starship, which can't be automated (the live chats, weekly emails, forum answers all require my time and attention), still sailed on – because I have systems for communicating, organizing, and responding on the go. As I came back to work yesterday to deal with my swelling inbox, I thought about all that had happened in my business without me even looking at it. The people who got to know me because of what I've created here. The people who started pursuing Holiday Sanity. Not because I did anything special, but because I'm working very hard to build a business that can survive life. It's easy to say that funerals and travel (and busy holiday seasons) are unusual. To assume this is something rare. That the this is just a bump in your otherwise stable business. That dealing with that kind of rush of orders (or personal life) is just something you have to survive for a few months. But the fact is, this IS your business and your life. Messy, sad, busy, exciting, exhausting, time off for recovery or traveling and handling whatever comes up. Sitting down to write, standing in line at the Post Office, answering emails. Your business is built in the quiet, focused, planned times. But it's not really a business until it survives through the messy, busy, scattered times. 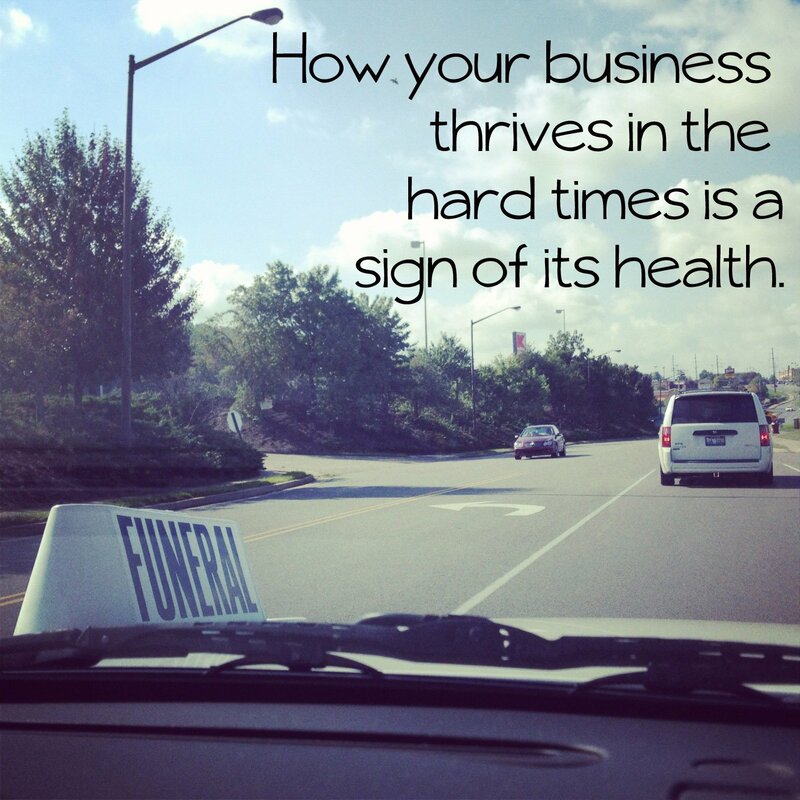 How your business behaves in the hard times is a sign of its overall health. If you can't take an afternoon off to bake cookies, or you're buried under holiday orders – this is a sign that your biz needs to get healthier. Instead of looking at this crazy time as something to get through, approach it as a time of training and information-gathering. In these crazy times, your business is telling you what it needs. It might be automation, scaled up production or shipping efficiency This is what your business needs to not only thrive when you're busy, but to grow into what you want it to be. Instead of powering through the hard times (and holiday season! ), learn from them. Take notes, make lists, experiment. What is your business (and life) telling you it needs right now? Want more survival tips? Check out the (free) Definitive Guide. Sign up here to get more on surviving your business adventures, no matter the season. The Holiday Sanity Kit gives you the space, questions, and system for learning from your busy holiday season. Make plans, get to work…and then reassess what actually worked and what didn't.